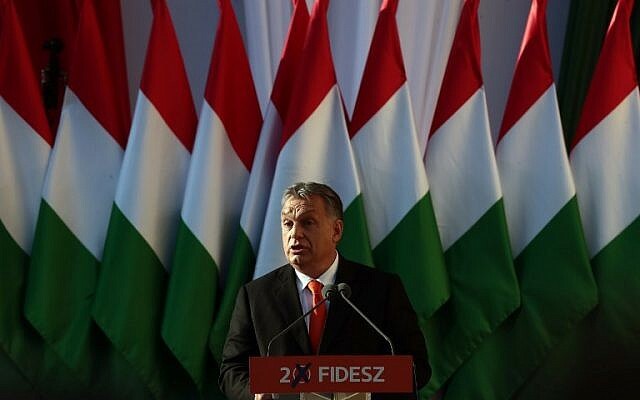 BUDAPEST, Hungary (AFP) — Hungarian Prime Minister Viktor Orban, one of Europe’s most controversial leaders, looks set to win a third consecutive term in an election on Sunday, despite uncertainty over tactical voting and turnout that could trigger an upset. 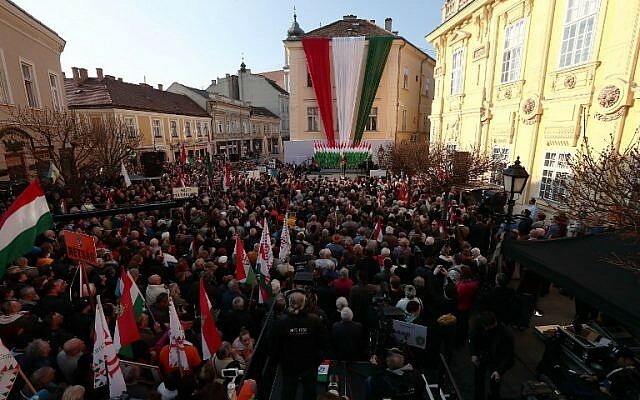 At a final campaign event on Friday in the city of Szekesfehervar, southwest of Budapest, Orban urged his supporters to turn out to vote. “It’s not enough to be ahead in the polls, we have to come first on voting day too,” he said, recalling his party’s loss in a 2002 election despite having been considered the favorites beforehand. The strongman nationalist’s Fidesz party enjoys opinion poll leads of between 20 and 30 percentage points over its closest rival Jobbik, a far-right party led by Gabor Vona that has been moving towards the center, and the leftist Socialists with their candidate Gergely Karacsony. The first results are expected to emerge one or two hours after polls close at 1700 GMT Sunday, with broader trends only emerging slowly over the course of the evening. “Rational logic suggests Fidesz will win, but there is something in the air that points toward a surprise,” analyst Gabor Torok said Friday. A mainly first-past-the-post election system designed by Fidesz after it came to power gives it an advantage over the fragmented opposition parties. 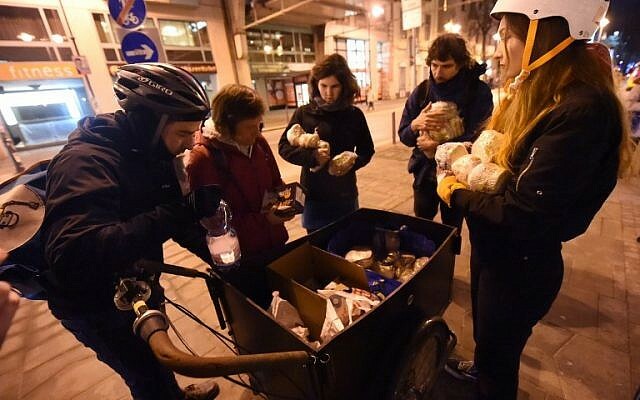 But a recent mayoral by-election saw Fidesz suffer a shock defeat after the opposition united behind a single independent candidate, sparking a surge in turnout. Analysts say nationwide turnout of over 70 percent would put Fidesz’s majority in danger. Since the by-election, civil society groups have urged nationwide tactical voting on Sunday to foil Fidesz in electoral districts, although the opposition parties have failed to present a united front. Despite being on course for overall victory, analysts say Fidesz is likely to fall short of a third consecutive two-thirds “supermajority” in the 199-seat assembly that has allowed it to railroad through controversial bills. Although the economy has picked up in recent years and wages are steadily rising, Orban’s campaign has focused on warnings about mass immigration by Muslims and Africans. Fears over immigration are entrenched in Hungary after some 400,000 refugees and migrants traversed the EU member in 2015, prompting Orban to erect a border fence that is popular with voters. Casting himself as a defender of national sovereignty and “Christian Europe” against the “globalist elite,” Orban has spearheaded divisions between the European Union’s western and eastern members like Hungary and Poland. On a visit to Budapest Friday, Jaroslaw Kaczynski, leader of Poland’s governing PiS party, endorsed Orban for Sunday’s vote. “Today the freedom, sovereignty and dignity of nations, for you and for us Poles, is tied to Viktor Orban,” he said. The 54-year-old Orban’s anti-immigration stance and verbal onslaughts against “meddling Brussels bureaucrats” have gained him admirers not just in nearby Poland but also among ultra-nationalists in western Europe and beyond. But Brussels has sued Budapest over its resistance to the bloc’s refugee resettlement plan, as well as laws targeting civil society groups and a university linked to the liberal US billionaire George Soros. The so-called “nuclear” step of launching “Article 7” sanctions over Hungary’s alleged breaches of EU values, a penalty so far only applied to Poland, has been raised and could lead to the suspension of Hungary’s European Parliament voting rights. 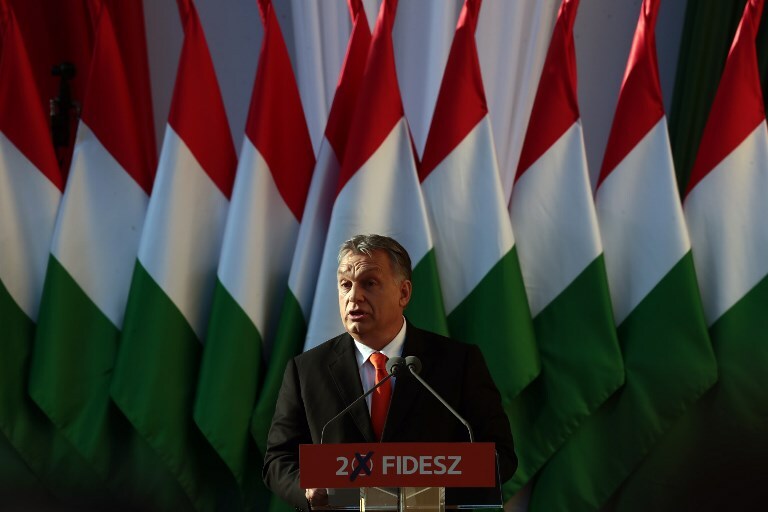 But a strong majority on Sunday would cement Orban’s plan, declared in 2014, to mold ex-communist Hungary (population 9.8 million) into an “illiberal” state modeled on countries like Russia and Turkey. During a bruising election campaign Orban has stepped up his long-running attacks on the Hungarian-born Soros which have included media blitzes called xenophobic and anti-Semitic by critics. 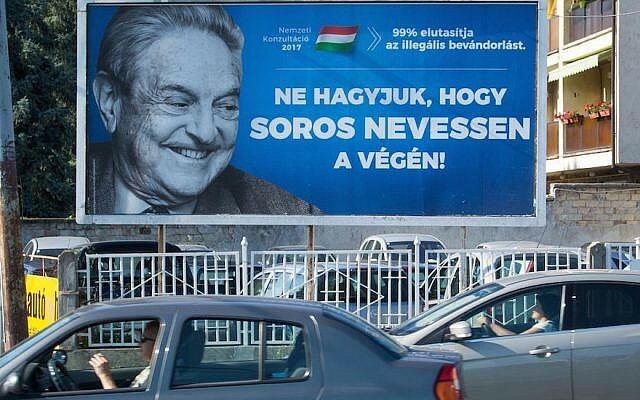 Fidesz posters show the slogan “For us, Hungary is first!” and the 87-year-old Jewish financier standing with opposition leaders, brandishing wire-cutters to take down the border fences. Orban himself has shunned debate with rivals and questions from the independent media, and appeared in public only at carefully choreographed events. His aura of invincibility has however been shaken by a wave of corruption scandals involving close allies and family members that have intensified in recent weeks and heightened unpredictability about Sunday’s result.